Phalanx often rises to the top of worst cover art lists and sinks to the bottom of best cover art lists, but I thought it was clever. I remember the ad in EGM and it was a great attempt at a unique design: A spaceship flying behind a banjo player. If we got invaded right now, that very situation could very well happen. Just replace old man with a hipster and the banjo with a Walkman. Don't take everything at face value. Kemco tried standing out from the myriad spaceship shooters that ruled the Super NES days along with one on one fighting games and platformers. That's all there was back then. That awkward jump kick in the background. Punk Mickey Rourke staring down Jesse Ventura. The Capcom artist for these Super NES fighting game boxes had some skill but definitely needed some inspiration beyond a staring contest. It's a fighting game. The fighting shouldn't be relegated to the background. Worst part of the box: The title font. There's a perfectly good logo on the arcade cabinet and title screen that they could have used. What's the deal? Best part of the box: A good game is housed inside of it. What? OK. This guy is yelling at you. Are you going to take it from him? Check out that sweet jump kick in rollerblades back there. Is that the same guy? Does he know how to use his hockey stick for actual hockey? He sure isn't convincing anyone if he does as he blew two chances to prove it. The girl in background on the other hand... That's how you hockey! Why isn't she up front representing? Worst part of the box: The teeth. it's always the teeth. Best part of the box: The world-renowned Street Sports pitbull up there. So... Kano shooting a couple of creatures that look like a cross between one of the Spies from "Spy vs Spy" and Kurt Hectic from "MDK?" Kurt Hectic? Maybe there should be a "Bad Video Game Character Name" list. Loving the sheet metal logo that conjures memories of the Home Depot heat duct aisle. Worst part of the box: You know when you're playing a game and you get to a stage with a fancy shiny floor? Looks great doesn't it? The designers were certainly proud of it because they took the time to, you know, put it in the game? Well, how many of those shiny, sterile floors have you seen where you can see your character's or any other object's reflection in it? Kind of makes you wonder why they put the floor in in the first place, right? Well, the artist couldn't even bother to add reflections in the obviously shiny floor on the box art, rendering the image lifeless and boring. This isn't the last we're going to hear from FCI. Best part of the box: That floor sure is clean. 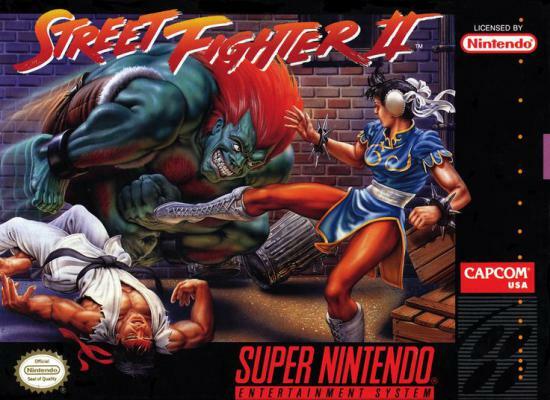 Capcom could have released this with a plain white cover with the words 'Street Fighter II' Written on it in the vain of The Beatles' White Album and it would have sold just the same. It brings up many, many questions: Why did they waste any amount of time and money on this ridiculous rendering? Is Chun Li supposed to be doing her lightning kick or is she losing her balance? Why is Blanka not rolling during his rolling attack? The alley is not representative of any of the game's stages, so why is it the one backdrop they decided to use on the cover? Why are there three fighters on the box? Were Chun Li and Ryu teaming up? Blanka obviously steamrolled Ryu just before this, Right? Otherwise, Ryu wouldn't be seemingly floating above the ground. Then where are his motion lines? Capcom makes great games that sell on their own merit, but they have some atrocious cover art. Worst part of the box: No amount of artistic detail can make up for the artist's obvious lack of inspiration. Why the floating garbage can? Does everything on this cover have to be in motion all at once? Best part of the box: The artist drew Chun Li's thighs proportionate with her body. We'll never see that again. This cover is anger inducing in more ways than the three obvious ones. The yellow text is unnecessary because if you didn't already know that this was a wrestling game from the big 'WCW' in the title or the word 'Wrestling' written underneath the word 'Rawl,' then you weren't looking for this game. 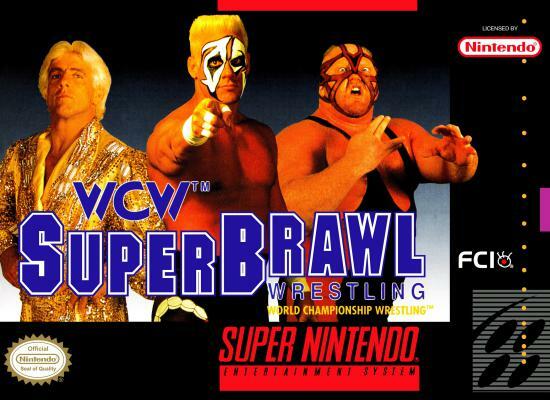 Basically: Nobody bought this game for any other reason than the fact that they were actively seeking out a WCW game. 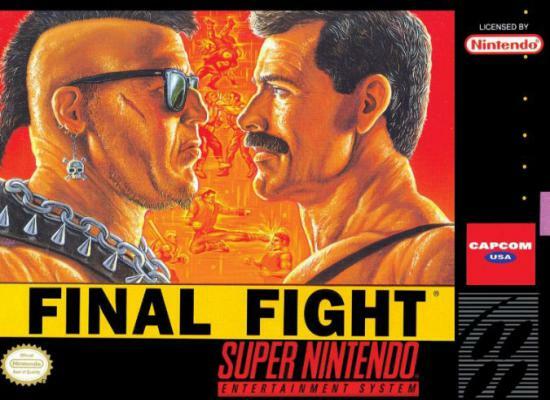 Hopefully you sold this to all twelve WCW fans who owned a Super NES, FCI. Worst part of the box: So, three guys, each having differing definitions of the word "toughness," walk into a Sears portrait studio... Lets talk about them: Guy number 1: Looks like he finally perfected the hairstyle he first debuted in his 11th grade yearbook photo. Hey, it only took him 35 years. Guy #2: Looks like Owen Wilson found the face painting booth at the Milwaukee State fair. Guy #3: I had to look this one up. Turns out his name is Vader, which upon discovering only leaves more questions. Supposedly there's something called "Vader Time?" Is the chipmunk scowl part of it? He had to know he looked ridiculous, right? At least they're all good sports for modeling three drastically different outfits that one should never leave the house in while wearing. Best part of the box: It conforms to the Super NES box standards just like every other licensed game on the system.